While the United States commemorates the adoption of the Declaration of Independence on July 4 with plenty of pyrotechnics, nature presents its own brand of fireworks all year long. Here are 11 spectacular fire and lights displays, from volcanic eruptions to the northern lights. 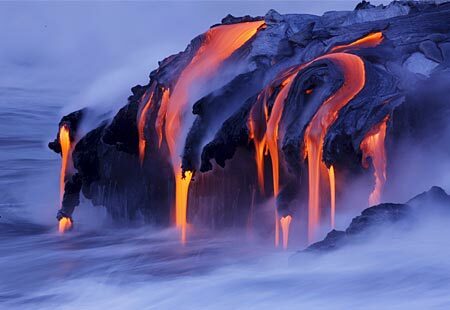 Kilauea on the Big Island of Hawaii has been dazzling spectators since 1983. Lava from this dome on the flank of 13,679-foot Mauna Loa flows to the Pacific Ocean, where molten rock sizzles into the water. 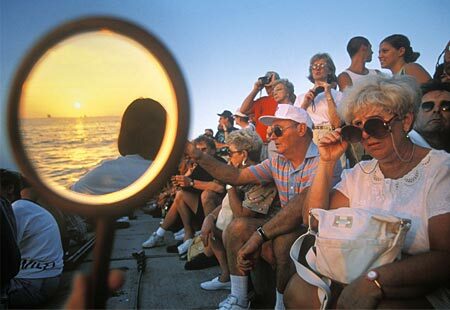 The best view is from tour boats. You can also see the subtle subterranean glow of magma from various spots around the volcano’s rim. 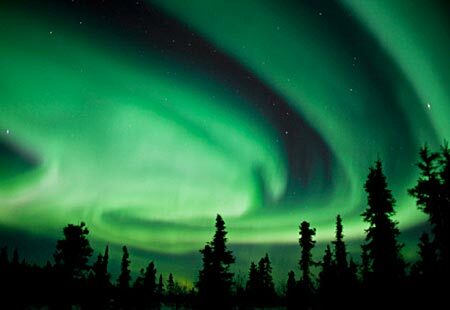 This phenomenon, triggered by solar wind in the Earth’s ionosphere, is available for viewing year-round in polar regions. You’ll have better luck during clear winter evenings above the Arctic Circle. For virtually guaranteed sightings of the aurora borealis, visit Bettles or Fairbanks, Alaska, or the diamond-boom hub of Yellowknife, Northwest Territories. There, several wilderness resorts, such as Blachford Lake Lodge, offer special packages for northern-lights seekers, including the all-important extreme-cold clothing. 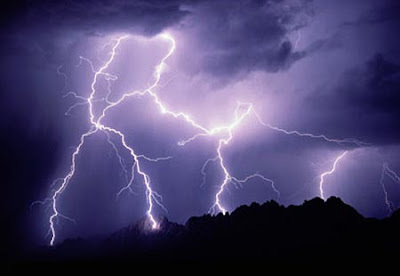 Want to see a spectacular three- or four-hour thunderstorm? Visit the Front Range of the Rocky Mountains anywhere in southern Alberta, Montana, Wyoming, Colorado or New Mexico. Almost every afternoon from May through September, the sun’s heat raises thermals that climb the sky and form thunderheads that are then steered east by the prevailing winds. So a round of golf or morning’s fishing can be followed by a late afternoon or early evening thunder-and-lightning show. 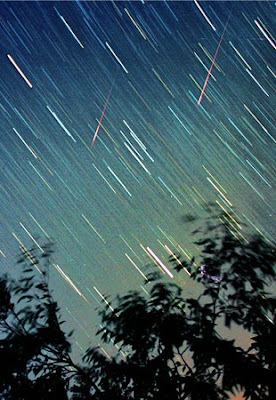 The Perseid meteor shower peaks around mid-August, and the best places to watch are higher-elevation Northern Hemisphere locales away from urban light pollution, such as Mount Washington in New Hampshire, Pikes Peak in Colorado or the back side of Sandia Peak near Albuquerque. Bring a coat and a sleeping pad for lying down, and reflect on the fact that the streak of light you see is caused by high-speed friction within the same atmosphere we breathe. So, take deep, slow, thankful breaths. 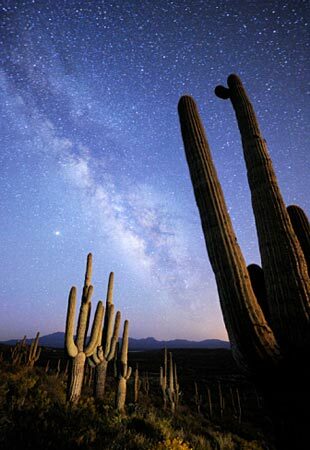 Contemplating infinity is the perfect antidote to a world in which instant global access makes the universe seem small. It’s not. Our home galaxy contains more than 400 billion stars, a number large enough to paralyze even the snazziest home calculators. Great places to admire the Milky Way are the Kohala Coast on Hawaii’s Big Island; the higher reaches of the Sonoran Desert in southern Arizona, such as the Tucson foothills; and the coastal islands of Maine on clear August and September nights. Sun dogs are luminescent light bands created by sunlight that shines through ice fog. They resemble rainbows but are less vivid. Nonetheless, they’re delightful manifestations of light, and it’s cool to tell people their scientific name: parhelion. 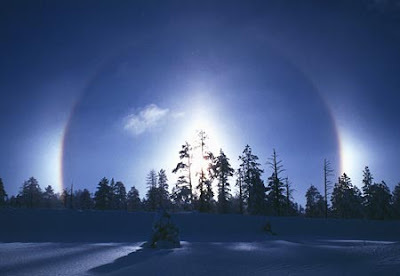 The ring around the sun one sees in winter is caused by light refraction through ice crystals at high elevations. More impressive are ground-level sun dogs that require ice fog. Ski areas known for that are Mount Bachelor in Oregon, Lake Louise and Sunshine Village in Alberta, and numerous Rockies resorts such as Whitefish in Montana. Morning is the best time to see sun dogs, as slanted light accentuates the effect. 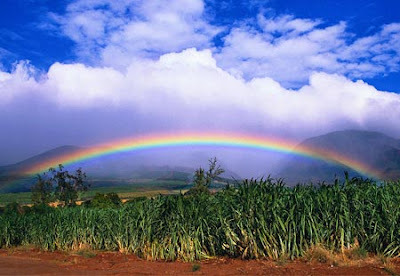 Admiring a rainbow in the distance amid the velvet mountains of Hawaii, the justly named Rainbow State, is a rich travel reward. Like sun dogs, rainbows are refractions of visible light through tiny drops of water; in this case, unfrozen water. Other notable rainbow venues are Western Canada’s incessantly shower-dappled Skeena River Valley; the verdant hills of Wales and Ireland; and the Florida Keys during the rainy season, mid-May to mid-October. Any Caribbean island is a great rainbow generator, as is Alaska’s Kodiak Island and the islands of the upper Great Lakes in Wisconsin, Minnesota and Michigan, from June to September. There’s a vast array of places to see great sunsets: Marco Island or Sarasota in Florida, Kauai’s Ke’e Beach, Sandia Crest above Albuquerque, or the shores of Santa Barbara, Calif. 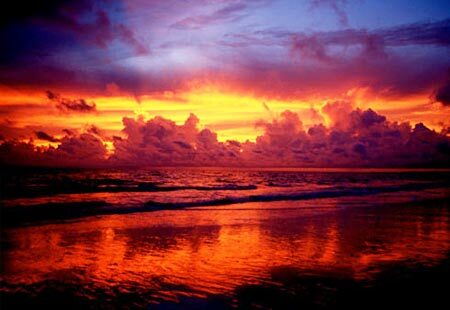 The best ones come over ocean waters or in desert skies, where either dust or humidity accentuate and spread the rich colors. More important than finding the right place is the right attitude: What better way is there to appreciate the miracle of physics whose light and warmth make life possible? I’ve read books by moonlight at 10,000 feet in the Colorado Rockies, snorkeled by the light of the moon in the Caribbean and skied by moonlight in Washington’s Cascade Mountains. 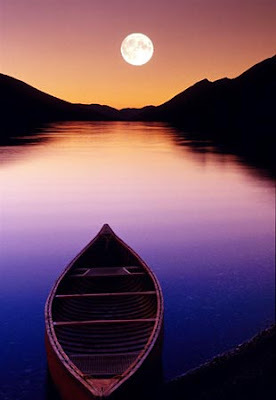 But nothing surpasses the sight of the full moon reflected in a placid body of water, backed by natural landscape features that provide their own character to the scene. See moonlight on a backwater by a mangrove cay in the Florida Everglades; on a timberline lake in the Rockies; on the Danube River in Budapest; or on a wilderness lake in Minnesota’s Boundary Waters. Howling is fashionable in certain quarters, but I prefer quiet contemplation. Skeptics pooh-pooh this famously evanescent phenomenon, but I’ve seen it and so have millions of others. Just after the sun sets over an unobstructed horizon, a momentary arc of green light appears. Oceans and large lakes are the best places to watch for this. Even if you don’t see it (and it's notoriously difficult to capture on film), it’s entertaining to discover that the sun’s movement is detectable to the naked eye. That the best venue is sitting on a beach only adds to the spiritual value of this sight. Try the west-facing shores of Florida, California and Hawaii. The airborne version of bioluminescence is one of the wonders of childhood. 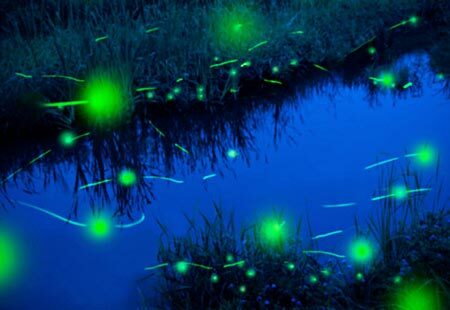 Two thousand species of little flying beetles called lampyridae are found in temperate and tropical regions around the world, including Japan, where fireflies are so beloved that they’re a metaphor for passionate love. One of the greatest novelties of all, however, occurs in the southeastern U.S., where some fireflies synchronize their flashes. Early summer visitors to Elkmont, Tenn., and Congaree National Park, S.C., can watch a sort of firefly Rockettes revue as hundreds of lightning bugs flash in unison. Robbie Savage for Strictly Come Dancing?